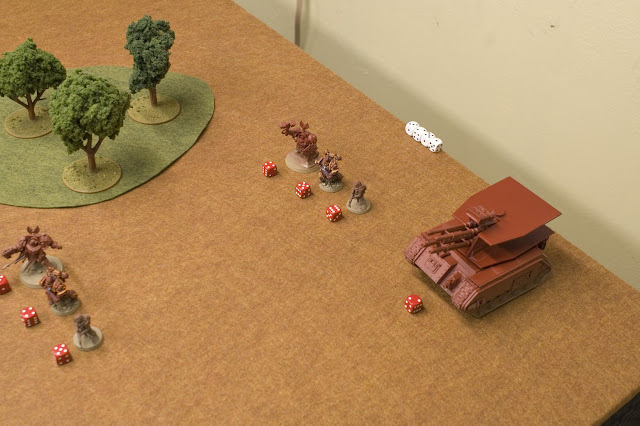 Today I decided to pull out some models and demonstrate what the visibility bands would look like on-table, and compare it our old system. Let's walk though it. First up, I've simplified the visibility levels by dropping the lowest one. It was only there because of the way the movement rules are currently written. So as to allow a unit moving At The Double to touch the edge of a wood they can't enter and still get some benefit from it. 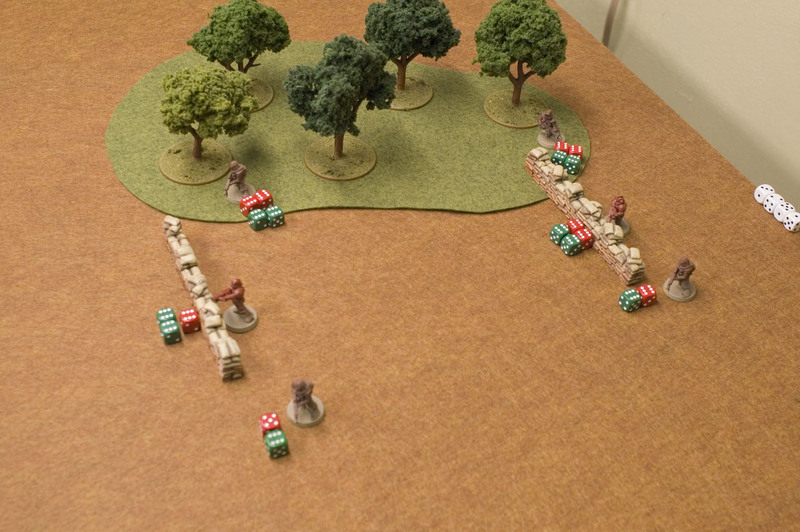 But that can be re-written so that area terrain simply reduces any movement by 1/2. 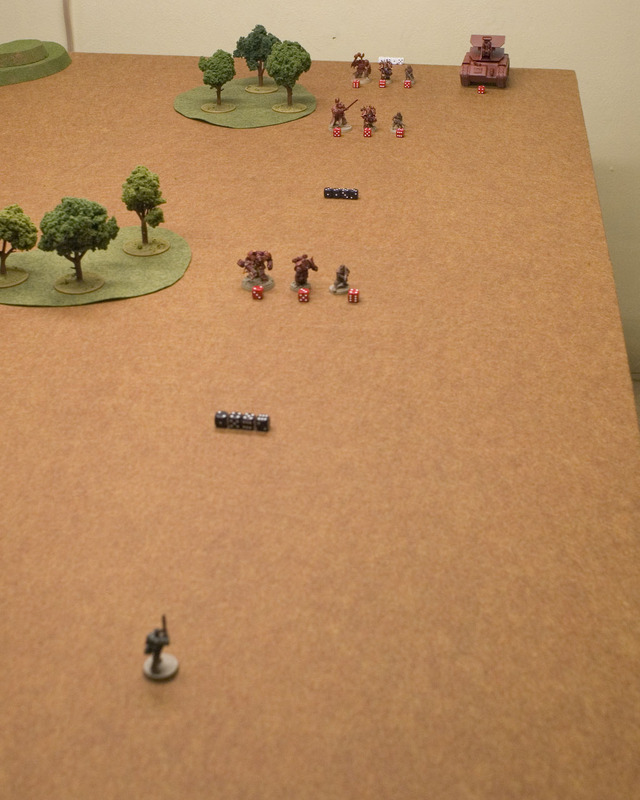 Such that infantry can overlap the terrain's edge. 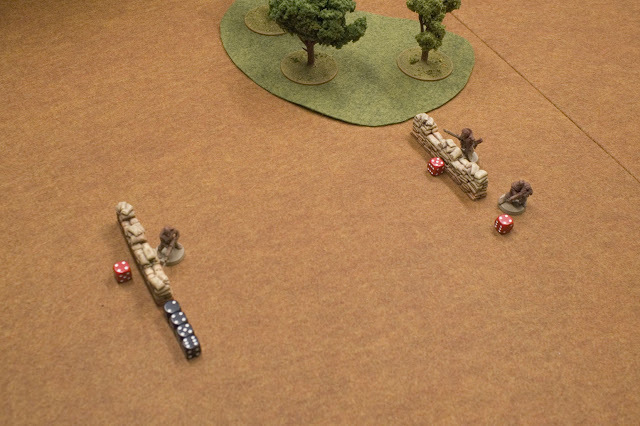 Letting them fire out without crossing it with their shots, yet getting some concealment from the terrain. The ATD restriction was there to provide a downside to running, but we've already got that covered by making them more visible. So the restriction isn't really needed anymore. So again, on open table, a target will be 'Clear'. If they run or shoot, they'll be 'Exposed'. If they Go To Ground, they'll be Obscured. 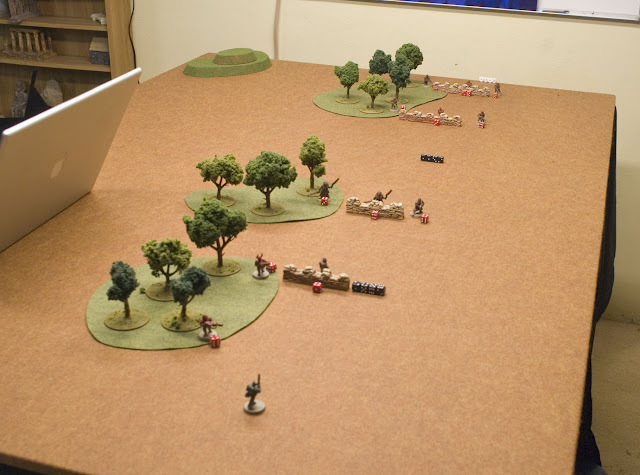 Let's start with infantry on an open field. 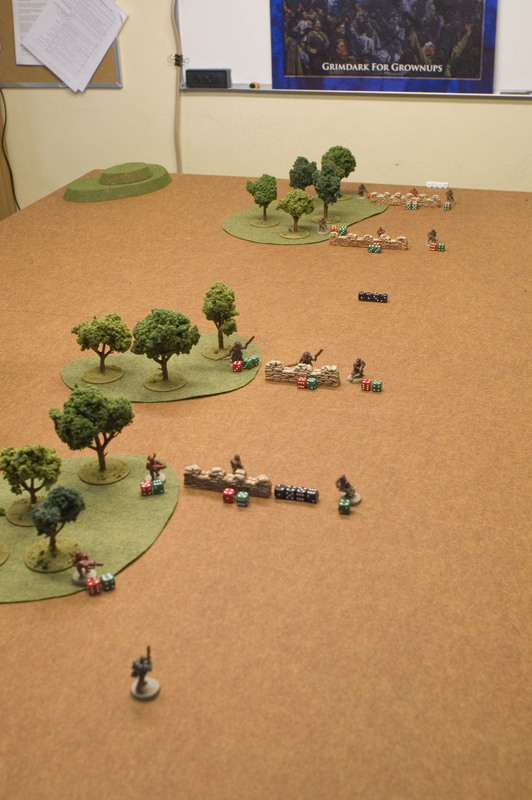 The green LaansGuardsman (bottom) is shooting at 3 different targets. Another LaansGuardsman, A Knight Legio, and a Knight Paladin. Each set of targets is located at the edge of a range band. The closer line of black dice shows the 12" 'short' range that the Guardsman would have under the old system. 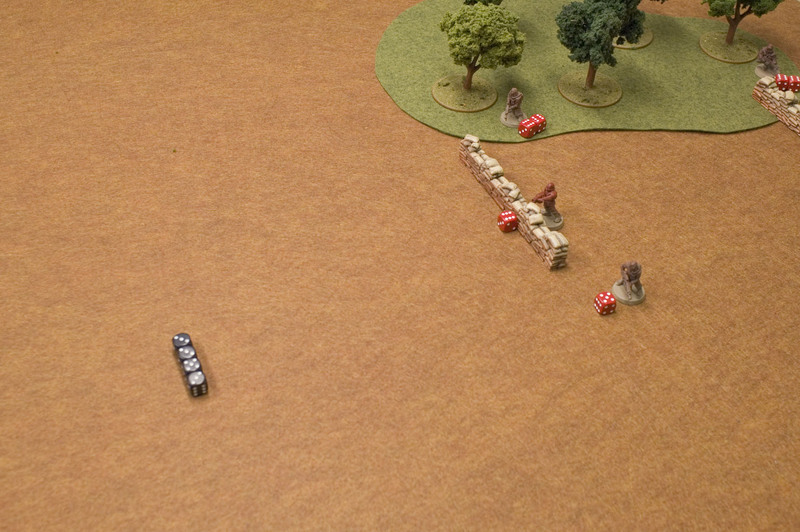 While the line of black dice further away shows how far his 36" range autogun could shoot under the current rules. 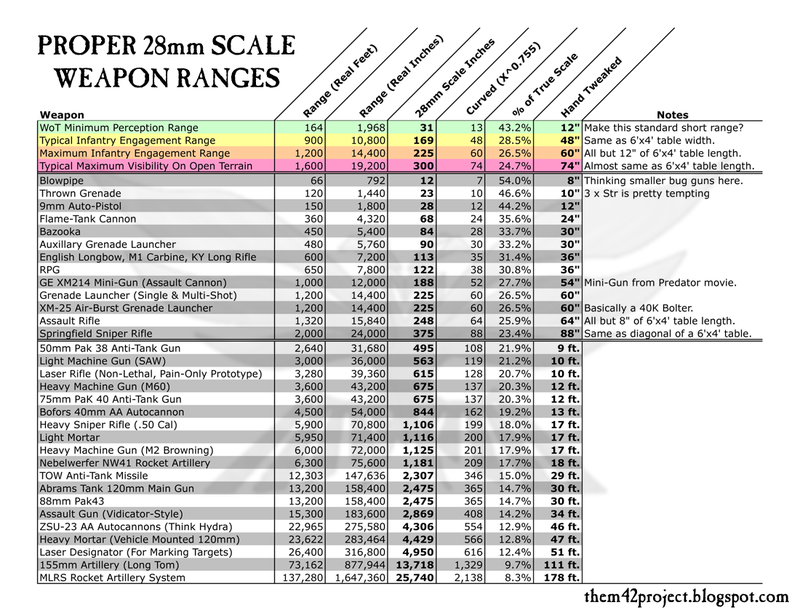 If you remember back to our discussions on weapon ranges, you'll notice that 36" corresponds to the range of a carbine-type weapon in our scale. While a true 'assault rifle' would be able to shoot about 64". 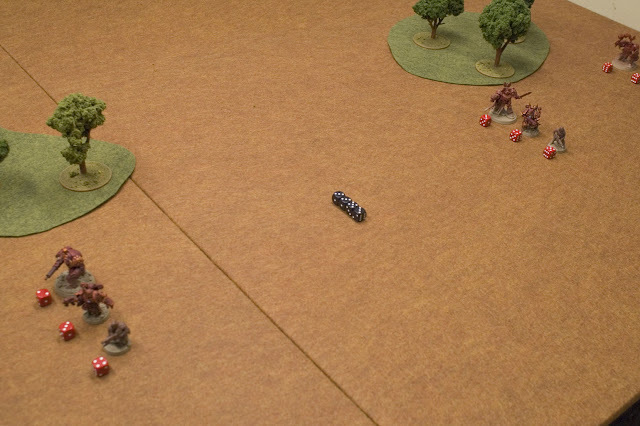 Which is just 2" short of the distance from the green Guardsman to the far edge of the table. 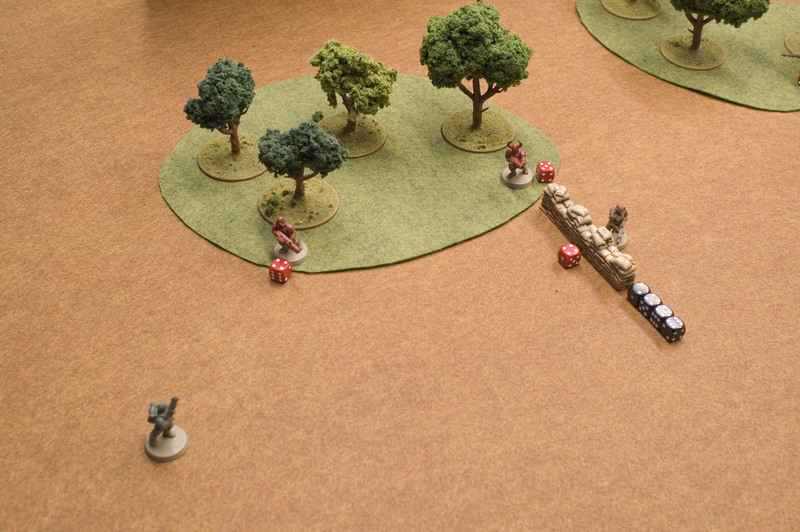 For this example, we'll work out what the guardsman needs to hit all the way to the edge of the table. As if he had an assault rifle. Because it's probably worth discussing whether we want to have infantry weapons with that kinds of range in this new system. But back to the walk-through. The standard short range for models on open ground that haven't shot or run is 24". 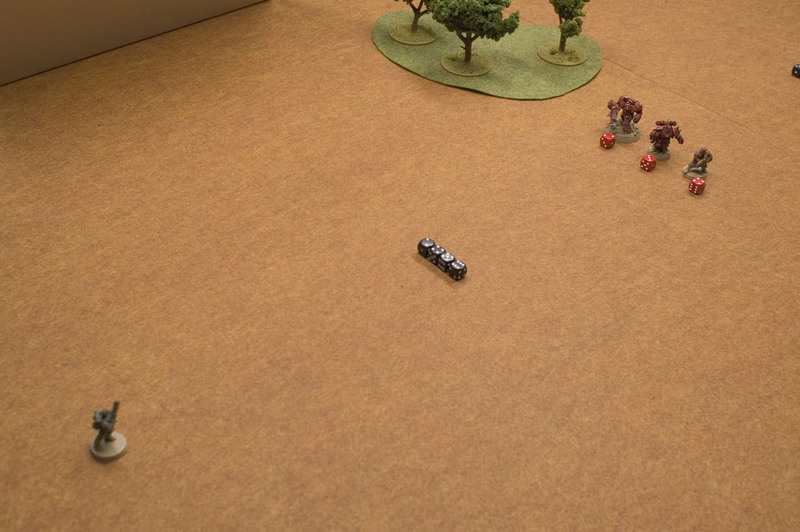 So I've placed the 3 target models at that distance. Being in short range means that there's no modifiers. So it's a straight BS vs. Evasion (Ev). The Guardsman's BS and Ev are both 6. A Knight Legio's Ev is 5, and the Knight Paladin's Ev is 4. So the guardsman will hit those targets on a 4+, a 3+, and a 2+ respectively. The next Ev bracket is always double the first one. So the short range of 24" gets doubled to 48" for the +1 Ev bracket. The guardsman will now be hit on a 5+, the Legio on a 4+, and the Paladin on a 3+. The +2 bracket is double the 48" of the +1 bracket, at 96". That's off the table, so anything beyond 48" is a +2. The guardsman is now hit on a 6+, the Legio on a 5+, and the Paladin on a 4+. Just for kicks, I put in an Ev2 tank. It would be hit on a 2+ (BS6 vs. Ev2+2). So really, we don't need to have any special rules for 'large targets' that increase or decrease visibility. Nor do we need a general 'stealth' rule. The Evasion stats take care of that difference. We really only need special rules for differences in a unit's visibility as it moves or shoots. Or for single infantry models. 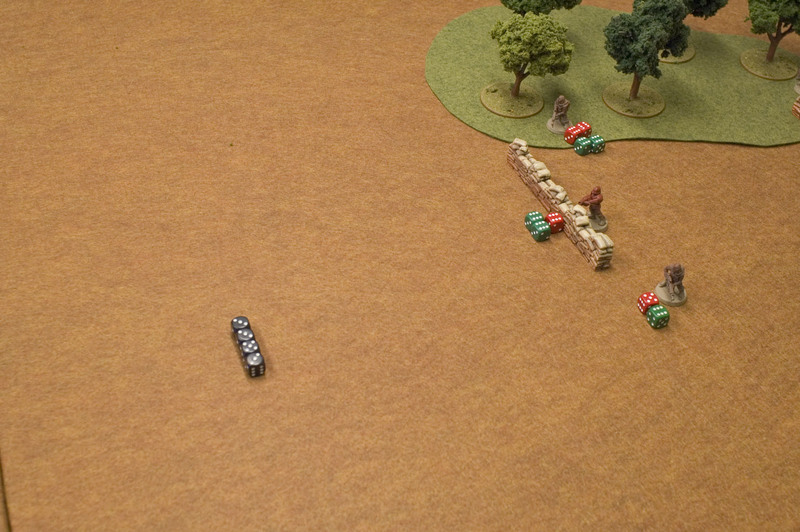 Laser: Unit can shoot without increasing its visibility. 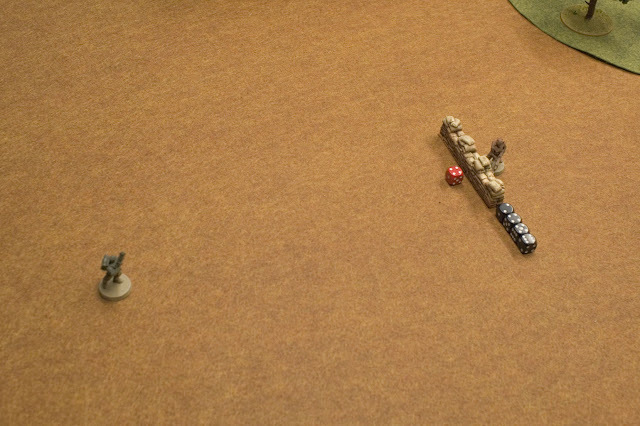 Stealth: Unit can run without increasing its visibility. Now we'll introduce some walls to make the models behind them 'Obscured'. For simplicity, we'll concentrate on just guard-on-guard shooting from here on. I've added target at the 12" mark, since this is the short range (half of the standard 24") when the target is obscured. At 12" the guardsman still needs 4's to hit. Because the target is within his short range. At 24", he'll need 5's to hit. At 48" he'll need 6's to hit. And beyond 48", he'll need double sixes to hit. Now we have some woods, and a new target at 6". The short range for a concealed target is 1/2 of that for an obscured target, which is half of the normal short range. 24" / 2 = 12" / 2 = 6". 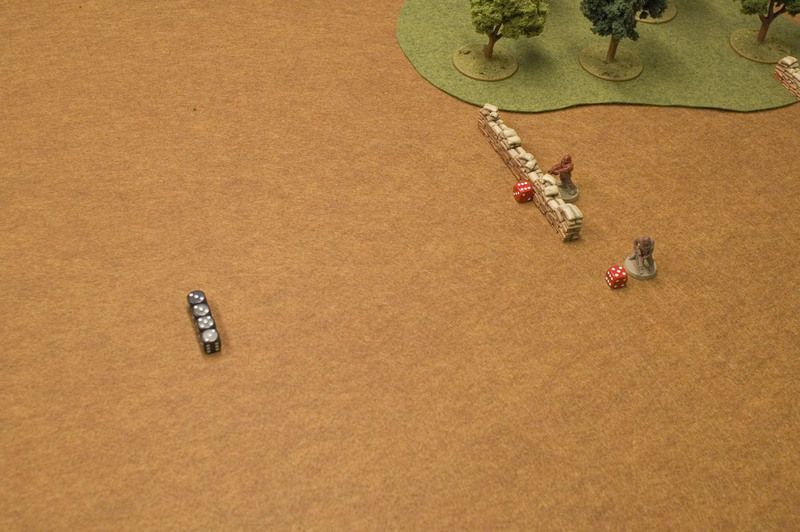 So the guardsman at 6" (short range) in the woods is close enough to be hit on 4's. 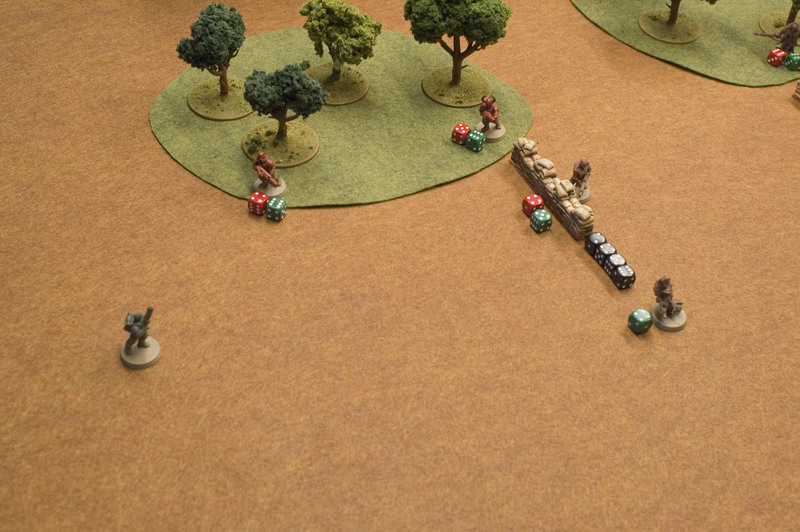 The guardsman at 12" (+1 Ev) is hit on 5's. The guardsman in the woods at 24" is hit on 6's. While at 48", the guardsman in the woods is hit on double sixes. As is the one way back at 64". Looking at this, I think that ALL terrain should be concealing by default. 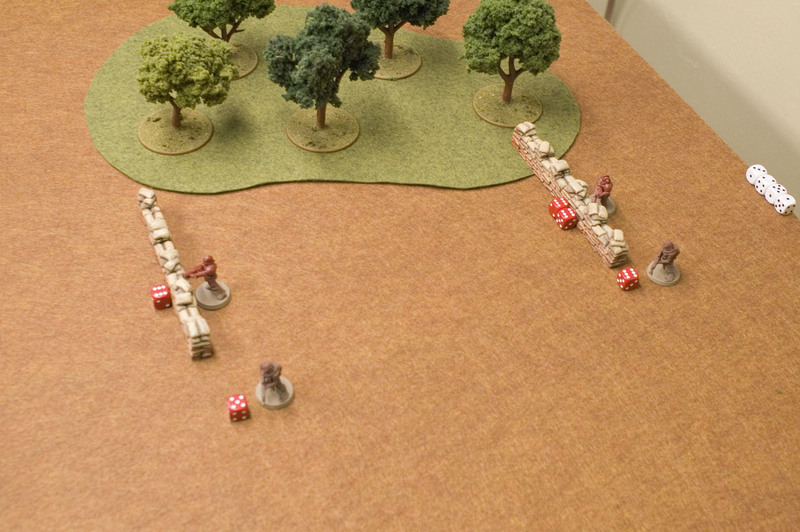 So that the model hiding behind a wall, and the model in a woods are both hit on the same roll. That way, a firing or running model in terrain will be considered to be 'obscured' instead of 'clear'. Reducing the terrain's benefit, but not eliminating it altogether. Just for kicks, I decided to try another system too. What if we just had standardized 12" and 36" range bands that didn't get halved or doubled by visibility, and just added straight +1 or +2 Ev modifiers for terrain instead? 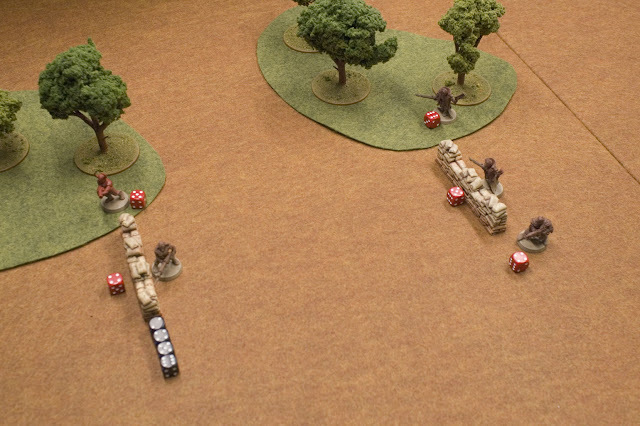 The green dice show what those to-hit values would be. 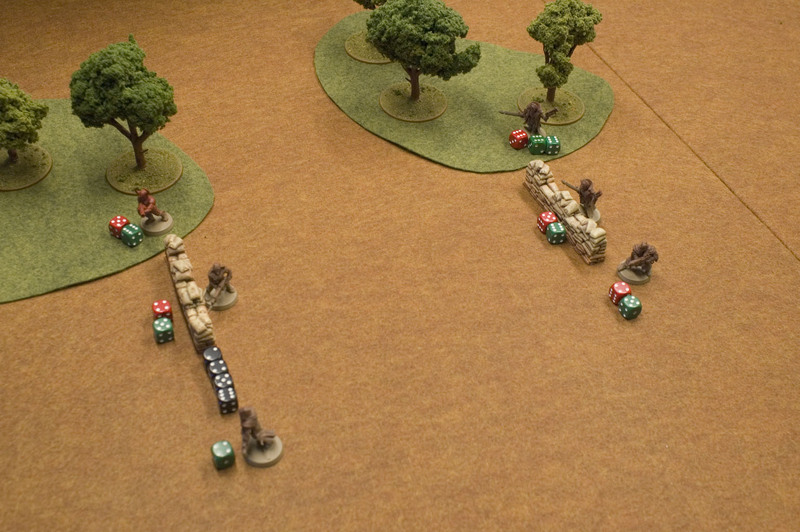 Compared to the red dice of the variable-bracket system. Well, at a 'short' range of 12 or less, and a standard +2 modifier for concealment, the model in the woods would be hit on 6's instead of 4's. While if the model behind the wall got a standard +1, it would be hit on 5's. 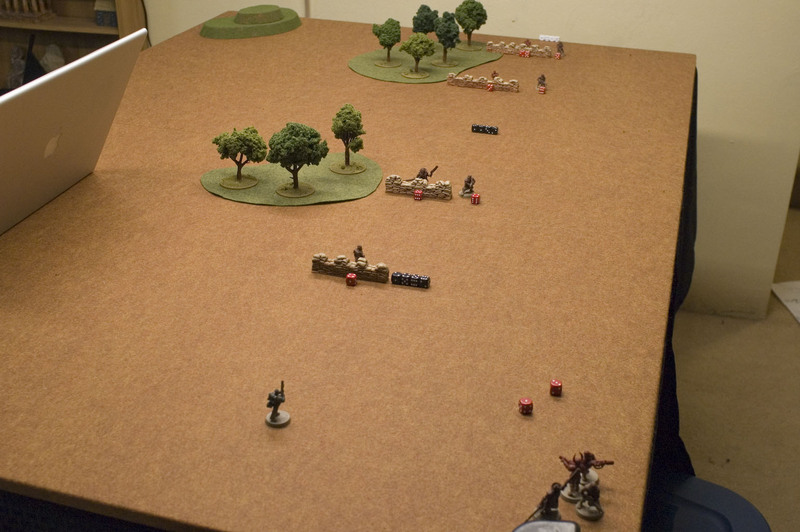 At 24" (right), the model in the open would be hit on 5's, the one behind the wall would be hit on 6's, and the one in the woods would already be in double-6 land. At 48", it's double-6's for everyone in or behind something. While the model in the clear is hit on a 6. Past 48", everything is hit on a double-6. So a fixed bracket system with 3 ranges (plus modifiers) is harder to hit in overall. With big penalties at the close and far end. At least without additional special rules. While the system I'm proposing of dynamic range brackets is easier at both ends, but especially close up. Where the benefits of cover disappear at 6". Which would also make close-combat shooting much easier (and bloodier) to do. Since all rolls would be straight BS vs. Ev.